← Welcome To Concord Island! Hampton & Richmond Borough impressed against their Conference South opponents, and will feel hard done by to have to travel to Essex for this FA Trophy replay. The match went ahead despite the match referee carrying out two pitch inspections as rain constantly fell on the Beveree pitch, and after last week’s desperately poor performance against Cray Wanderers, the home team and fans were hoping for an improvement. And boy did they get it! It turned out to be the best performance over ninety minutes that I’ve seen from The Beavers this season. The conditions, and the doubt over the match taking place, certainly had an effect on the crowd, with only 241 hardy souls venturing out to see the game. The fact that it wasn’t a league match, and was also the third of six home games in 25 days could have had something to do with it too. Chelmsford settled quicker, and after just a couple of minutes a shot flashed wide from tall winger Robert Edmans. The home side settled shortly after though, and a series of excellent corners from Neil Jenkins caused chaos in the Clarets backline. Gary Holloway had a header saved from one, and the next delivery seemed to completely deceive rookie goalkeeper David Wootton as the ball went straight in, but the referee saw something untoward and disallowed it, much to the confusion of the home faithful. Wootton was a late replacement for regular stopper Stuart Searle who was injured in a car crash. Joe Turner, impressive in central midfield in recent weeks, had the next opportunity on ten minutes. The first of several good Hampton moves involved Joel Ledgister and James Simmonds, with the former setting the latter away down the right; Simmonds then passed the ball back to Turner, and he turned onto his left foot and fired well off target. Shortly after, and another excellent Jenkins corner was punched down by Wootton straight to Powell, but the ball came at him very quickly and he couldn’t properly adjust, and put the ball wide. Eight minutes into the second half, Chelmsford took the lead through a scrambled Max Cornhill effort after a goal line clearance. Hampton didn’t let their heads go down though, and Mo Harkin brought a good save out of Wootton, and Charlie Moone had a shot blocked. Moone wasn’t to be denied for long, however, and he levelled things after 63 minutes. Picking the ball up on the left, he drove infield before hitting a wonderful shot across Wootton and into the bottom corner. It was his fifteenth goal already this season, and his fourth in three Trophy games. 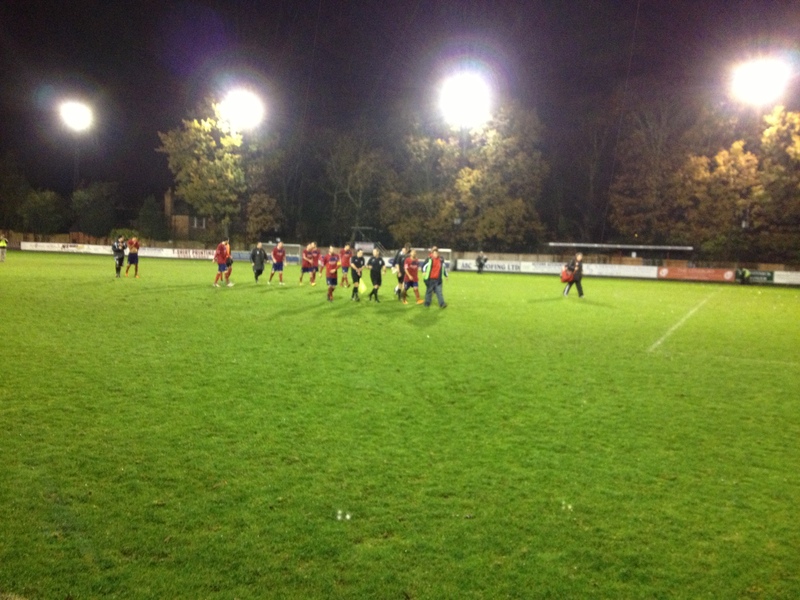 Just two minutes after the goal, Borough hit the post an incredible three times in one sequence of play! Charlie Moone’s cross hit the upright, and then Ledgister and Turner contrived to strike the uprights from rebounds. Incredibly, just after that passage of play, a cross was deflected by Kenny Clark onto the post. To say that the visitor’s goal was leading a charmed life is something of an understatement! Into the last seven minutes, Joe Turner robbed a defender of the ball and got clean through, but he lacked composure and fired well over the bar. James Simmonds then curled a shot agonisingly wide, while the final effort went to Joel Ledgister, who shot tiredly at Wootton in stoppage time. It was a superb performance from the home side, and if for some better finishing, and indeed some better luck, this would have been a comfortable home win. Maybe City have one eye on their big FA Cup showdown with Crawley Town. Either way, the two sides will now reconvene on Monday night (November 26) at Melbourne Stadium to decide who makes it through to the second round. 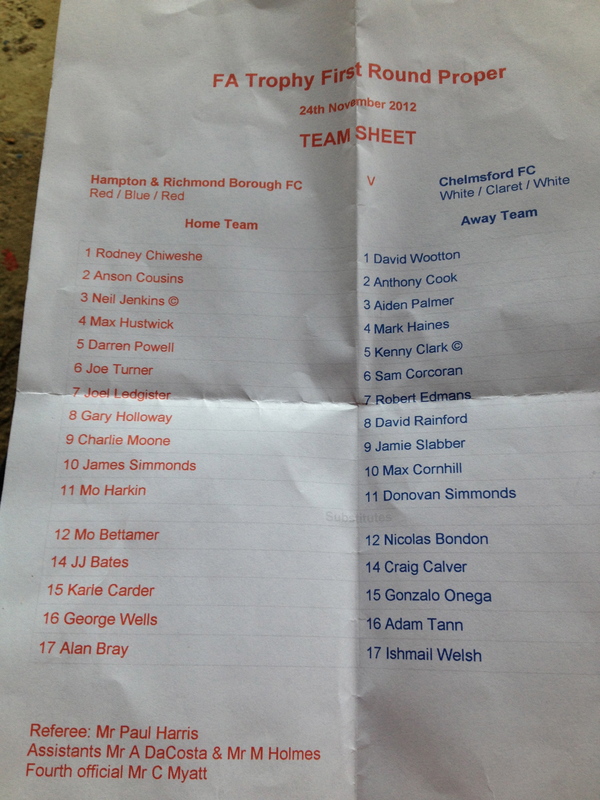 Posted on November 25, 2012, in UTL Archive and tagged Charlie Moone, Chelmsford City, David Wootton, FA Trophy, Hampton & Richmond Borough, James Simmonds, Joel Ledgister, Max Cornhill. Bookmark the permalink. Leave a comment.